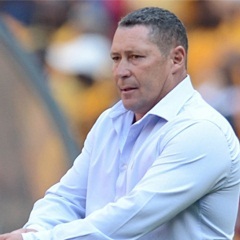 Johannesburg - After picking up a crucial point away from home, AmaZulu coach Steve Barker remains confident his side can lift themselves from the bottom of the Premiership table if they are able to tighten their defence with nine matches left in the league season. AmaZulu fought back from a goal down to draw 1-1 against Mpumalanga Black Aces in Mbombela on Saturday night. "When we're on top of teams we're not really capitalising as much as we can," Barker said. "In the first half I was disappointed we were not to be able to get a goal. We did not use the chances we created. "In the second half I thought they were a bit better than us and put us on the back foot, but fortunately we had the character and nerve to come back and get the equaliser. "For me it's a point gained against a tough team away from home, and as long as we can keep picking up points on a regular basis we'll give ourselves a chance." With 10 minutes left in the game, Dino Ndlovu was brought down by Mbulelo "OJ" Mabizela in the area and Thanduyise Khuboni hit the back of the net for Aces from the resultant penalty. A few minutes later, however, Bongi Ntuli connected with a pass by Bongani Ndulula and, given space by the home side's defence, he flicked the ball in to save a point for the visitors. Having scored six goals in their last two matches, Barker believed they had the ability to put teams away by dominating up front, but they needed to shut out their opponents at the back. "We're showing we can score goals but clean sheets are alluding us," he said. "We're making crucial errors at the wrong times and giving teams chances. "If we can tighten that up and continue to score goals we will win more matches than we draw." Aces coach Clive Barker was full of praise for his nephew, who joined AmaZulu in November, though he was disappointed his own side were unable to pick up three points at home as they remained entrenched in the bottom half of the standings. "We created a lot of chances and should have rolled them over the line but all credit to AmaZulu. They fought hard and made a good game of it," said the former Bafana Bafana mentor. "Compliments to Steve. I think he's got his team a lot fitter than they've ever been before so I'm delighted by the progress made by them, and also the progress made by us."